Announcement We offer high-quality and professionally created printables for parties, home decor, Christmas, weddings, hen nights or just for fun! Party packs (including invitations, bunting, welcome sign, cake toppers & thank yous), party games (scavenger hunts, drawing games, conversation starters, bingo), printable wall art, wedding stationery, unique advent calendars, and other awesome papercraft stuff. We offer high-quality and professionally created printables for parties, home decor, Christmas, weddings, hen nights or just for fun! Party packs (including invitations, bunting, welcome sign, cake toppers & thank yous), party games (scavenger hunts, drawing games, conversation starters, bingo), printable wall art, wedding stationery, unique advent calendars, and other awesome papercraft stuff. These were brilliant and spread a lot of kindness! Thank you. Printable party packs, party games, weddings, art, stationery and supplies. Faffy Tea is the brainchild of Bristol-based graphic designer Jodi Head. Jodi has over 12 years experience working freelance for businesses and agencies all over the UK. At Faffy Tea we have experienced how expensive parties can be once all of the decorations and partyware are purchased, and saw the huge cost benefits of printing from home and offering instant digital downloads. Faffy Tea was born! For a Pinterest-worthy party you can download party items from Faffy Tea for a one-off price, and then print as many as you need from home. Cover your entire house with bunting if you wish. As well as full party packs (just add food and guests for an instant party) we also offer digital downloads of individual partyware items (such as invitations and bunting), party games, and beautiful non-party stuff such as wedding stationery and printable art. And our most popular items are our printable Advent Calendars! Faffy Tea's high-quality and professionally created designs hopefully make us stand out. Jodi says: "When I request my boyfriend to make me a cup of tea that goes against the norm, it's a bit 'faffy' (even if the process is actually quicker than a regular cup of tea), hence he calls it a Faffy Tea. Some examples are: a herbal tea, fruit tea, decaf, redbush, loose leaf etc". Hello! 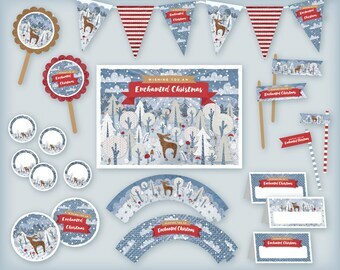 We offer high-quality and professionally created printables and digital downloads for celebrations, birthday parties, Christmas, weddings and hen parties: Party packs and decorations (including invitations, bunting, cake toppers), party games (scavenger hunts, forfeit cards, bingo games), printable art, unique advent calendars and other awesome stationery-based stuff. We only sell DIGITAL FILES, so nothing will be posted to you. Upon purchase you will receive a link from Etsy to instantly download the files. Please check the individual item's listing for the types of files that you will receive, however most often these are high-quality PDF files that can be printed by a home inkjet or laser printer, or by a professional printing company or shop. To fulfill your order, you must provide us with certain information (which you authorised Etsy to provide to us), such as your name, location, and the details of the product that you’re ordering. You may also choose to provide us with additional personal information if you contact us directly for a custom order. - Transfers of Personal Information Outside the EU. We may store and process your information through third-party hosting services in the US and other jurisdictions. As a result, we may transfer your personal information to a jurisdiction with different data protection and government surveillance laws than your jurisdiction. If we are deemed to transfer information about you outside of the EU, we rely on Privacy Shield as the legal basis for the transfer, as Google Cloud is Privacy Shield certified. - Change, restrict, delete. You may also have rights to change, restrict my use of, or delete your personal information. Apart from exceptional circumstances (like where we are required to store data for legal reasons) we will generally delete your personal information upon request. For purposes of EU data protection law, the founder of Faffy Tea, Jodi Head, is the data controller of your personal information. If you have any questions or concerns, you may email Jodi at: hello [!at] faffytea.co.uk. Alternately, you may write to Jodi at: Jodi Head, 52 Tilling Road, Bristol, BS10 5AL, United Kingdom.